This year I will be riding the PMC again. It is my sixth time. The PMC is a great organization - last year 100% of rider-raised revenue went directly to support the Jimmy Fund and Dana-Farber Cancer Institute. This year I am again directing all contributions from my ride to the Dmitri Itzkovitz Pediatric Brain Tumor Research Fund. Dmitri is a brave young man I have had the privilege to get to know as pedal partner of Team Year Up. Dmitri has been fighting brain cancer and his family has set up a fund at Dana Farber to support pediatric brain tumor research. Brain tumors are the top cancer killer of children, but pediatric brain tumor research is woefully underfunded. This is the only program of its kind in the world. 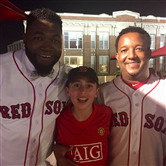 Check out the photo of Dmitri and Big Papi from an event at Fenway in June. Thanks for your support - I will be thinking of each of you as I pedal away from Sturbridge to Provincetown.